This is a sequel to http://macgyverdev.blogspot.se/2014/01/setup-jenkins-project-from-git.html where I set up Jenkins to build my latest project. The next step is to install the war-file built by Jenkins on my Tomcat 7 server. Now, in Jenkins you must install the Deploy Plugin. You find it in the plugins section. 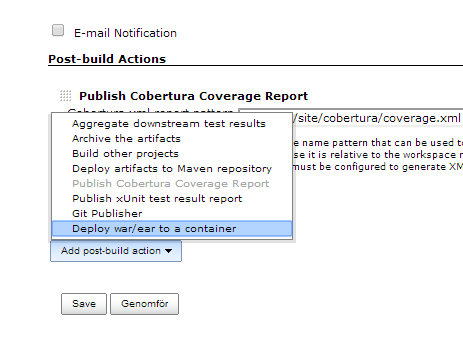 For this Jenkins job, go to the settings page and add a new post-build action. Choose the "Deploy war/ear to a container". In this view make sure the path to the packaged war is relative to the workspace area of the job. Most probably it will be "target/yourapp.war". Now, rebuild your job and when inspecting the console logs you should see that the war/ear is installed! This way it takes two clicks from editing the code in Eclipse to update the site All About Units in production, first commit and push to Git, second start the Jenkins job. One note, if you have deployed your application with context root "/" in Tomcat as I have done, see http://macgyverdev.blogspot.se/2014/02/how-to-change-context-root-to-in-tomcat.html, you can not have Context path = "/" in the configuration above. Instead, keep multiple context roots in Tomcat, and as in my example add the context root with a longer name, otherwise the deploy plugin cannot undeploy the ROOT web application. If you according to my blog post on it has manipulated the server.xml a reinstallation of "/webappname" will also reinstall the ROOT application since they point to the same directory on disk. I seem to have problems with this plugin when multiple jobs are deploying to the same tomcat in parallel. In which case there seems to be some sort of resource contention and the deployments hang. Is this a known issue ?